Which famous hero are you from Greek Mythology? What would you be doing in your free time? Making a mess in my room and yelling "BELLEROPHON DIDN'T DO IT!" I don't know. *panicking* I DON' KNOW!" Which of these fits your personality? Do you like killing monsters? I could never ruin anybody's life in such a way! A brindle, you know, the thing you put on horses? Finally, which Mythological hero do you think you are most like? Orpheus. He could do anything he wanted because the whole world adored him and his music. Perseus! I love him so much, I think I'll name my cat after him! You got Heracles! More commonly known as Hercules, he is one of the most famous Mythological heroes of all time. This is because of the countless monsters he's fought and the infamous 12 labors. Hercules is known for being quick to anger, and has paid the price for that many, many times. You got Perseus! Perseus is famously known for killing the gorgon, Medusa, and chopped her head off to prove his worth. He did so by using his shield as a reflective surface in which he could track Medusa's movements without directly looking at her. He is also known for being insecure about his past, as he and his mother were refugees at a kingdom named Seriphos. You got Theseus! This hero is known for navigating the labyrinth, with the aid of Ariadne, and killing the Minotaur. He is famous for his ADHD actions as he is always distracted, but when he puts his mind to something, he can focus like a laser beam. You got Bellerophon! People aren't really such a big fan of you, I mean, Bellerophon literally means "Killer of Belleros". But you manage to turn that around in many different ways! You have a sweet, kind personality and will do anything to prove your worth. You got Atalanta! She is one of the few heroes in Greek Mythology that is actually a women. Back in those times, women were thought to be only housekeepers and caretakers of the children. Atalanta's name means "equal in weight", meaning that she's as good as a man. You got Jason! This hero is famous for his journey on the ship, the Argo, and retrieving the Golden Fleece of Chrysomallos, the magical flying ram, with his buddies, the Argonauts. You got Orpheus! A kind, gentle person who hated harming others. He cared deeply for his one, true love, Eurydice. He loved her so much that when she died, he marched down to the Underworld and demanded Hades give her back. He had a deep passion for music too, playing the lyre of Apollo. 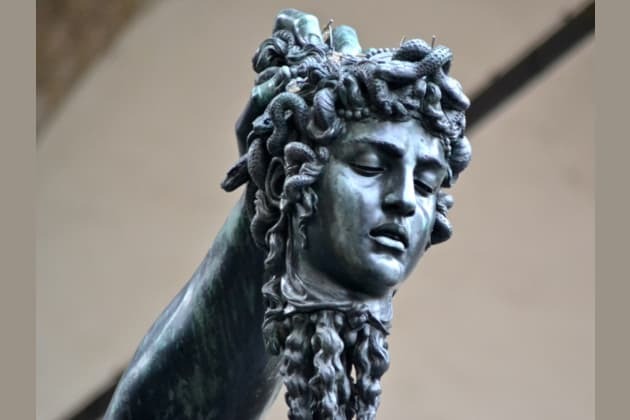 Will you slay Medusa like Perseus? Or sail aboard the Argo like Jason?